Over Christmas in 2003, I was watching the BBC news with my grandfather, hoping to hear that ESA or NASA had picked up a signal from the Martian surface. We waited. We waited a bit more. However, it wasn’t until some weeks later (if I remember correctly) that the UK’s Beagle 2 Mars lander was officially declared dead (although I suspected as much in the 30 minutes of silence after the time it was supposed to touch down). 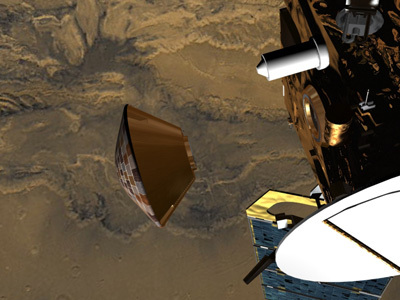 The little lander’s taxi ride across millions of miles of space, the Mars Express, was working just fine, but Beagle 2? Not so much. This was incredibly sad on so many levels. From a patriotic viewpoint, I was shattered. The chance to have a British presence on the Red Planet would not only have been inspiring, it may have given funding a small boost for the UK science community. Also, personally, only the week before, I’d been defending the mission to some friends who were convinced that the crazy idea of sending a British probe to Mars was pointless, as it was never going to make it. What ever came before that December in 2003, it was all academic. Beagle 2, for whatever reason, didn’t phone home. Game over. Of course, that wouldn’t be it. For months after, Martian satellites hunted for any evidence for a mini Beagle-shaped divot in the red dirt. Eventually, they found it, two years later. So what happened to the little robot? Why did it turn into a meteorite and not a lander? Well, back in 2008, Madhat Abdel-Jawad and his engineer team at the University of Queensland thought they’d worked it all out. Apparently, Beagle 2’s gyroscopic spin was too fast, causing it to become unstable during re-entry. This may have caused it to tumble as it entered the Mars atmosphere. Obviously, tumbling isn’t good, so it hit the ground like scrap metal. As it turns out, the Beagle 2 team are far from convinced this happened at all. Arthur Smith of Fluid Gravity Engineering in Emsworth, Hampshire, points out that Abdel-Jawad’s team did not simulate re-entry in a gravity field, and they failed to realize the lander had an offset centre of gravity. This means the simulation wasn’t complete, indicating the “tumbling Beagle” may not be the final explanation. This is your genius. You're ability to so charmingly personalize a story that, to the scientifically challeneged, might have seemed remote, technical, cold and boring. All the information is still there; it's just accessible to everyone.I hope they do come to fully understand what happened to the intrepid Beagle 2. As you present it, one can almost feel Beagle's frantic last “thoughts” as it hurtled to its death. One day, and you'll be around to see it, someone will bend down and pick up the pieces. I hope you're the one who tells the rest of us about that, too. I remember sitting and watching that also, hoping for Beagle 2 to phone home. I'd similarly been expressing to friends how cool it would be for the UK to send probes out and get results like NASA and ESA.